Berker’s high-quality plastic components have been produced using Arburg injection moulding machines for the last 40 years. A very special event celebrating decades of successful cooperation was scheduled for April 2018: the ceremonial handover of the 100th Allrounder. The Berker brand belongs to the Hager Group and manufactures switch series and building technology systems. The products, for which the high-quality plastic components have now been produced for the last 40 years by Berker using injection moulding machines from Arburg, are in use worldwide. “With our 100th Arburg machine, we are entering new dimensions. It is the first three-component Allrounder and also the first in machine size 630 S with 2,500 kN of clamping force”, says a delighted Head of Production, Sebastian Walther, who together with Christoph Koch of the Berker production management team travelled to Arburg Lossburg in order to officially take delivery of the anniversary machine. At the ceremonial handover of the anniversary machine, Ralf Müller, Head of Technology & Key Account Management, expressed his thanks for the trust and continued cooperation: “Since the purchase of the first Allrounder in 1978, there has hardly been a year in which Berker did not buy a machine from us. Their machine fleet now comprises hydraulic, hybrid and electric Allrounders, as well as vertical machines. From 2003, the Multilift robotic systems and in 2008 the Arburg host computer system (ALS) were added.” With the successful implementation of the turnkey system, the Berker-Arburg cooperation has now entered a new dimension. 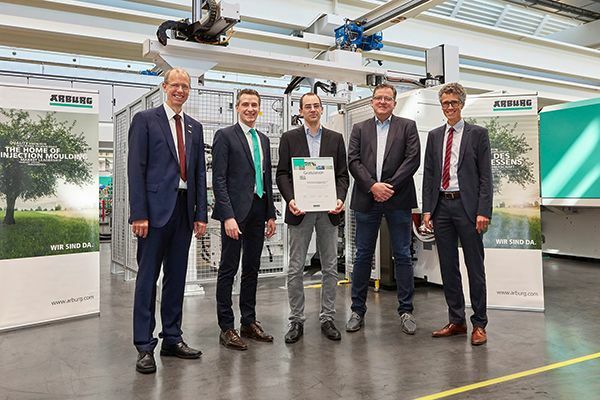 In memory of the “100th Allrounder for Berker” anniversary, Ralf Müller presented Sebastian Walther and Christoph Koch with a certificate and a plaque. Climate Change Levy (CCL) has Increased! Are You Prepared? Related Post Arburg On Track for Success With "Road to Digitalisation"
You can disable cookies by changing your browser settings. Further information about the procedure to follow in order to disable cookies can be found on your internet browser provider’s website. Strictly Necessary Cookie should be enabled at all times so that we can save your preferences for cookie settings. This website uses Google Analytics to collect anonymous information such as the number of visitors to the site, and the most popular pages. Keeping this cookie enabled helps us to improve our website.